ST. MARYS – Wapakoneta is starting to healthy and it could not have come at a better time as the postseason approaches. 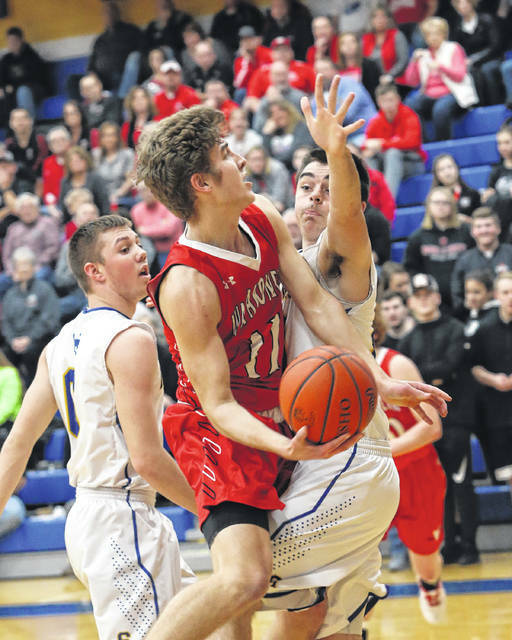 But even though the Redskins are getting all their players back, Wapakoneta needed a strong second half to hold off Auglaize County rivals St. Marys , 52-46, to claim the comeback victory in a Western Buckeye League affair Friday night. With the win Wapakoneta improves to 14-8 for the season and grabs as hare of second place in the WBL with a 6-3 mark. St. Marys falls to 7-15 and drops to 4-5 in the league. It took some second half adjustments for the Redskins to garner the win. Davis added that on defense the Redskins were gambling on steal attempts and failing and so they also cut down on that in the second half as well as talking bad shots. Davis said they changed their offensive approach in the second half to display an open post and were able to attack the basket with more regularity. St. Marys head coach Craig Szymczak said St. Marys’ defense helped stop the Redskins in the first half and with them controlling the boards they were able to limit the Redskins to one shot. But that changed in the second half. Perhaps motivated by senior night, it was the Riders, with a tenacious defensive attack, took control of the game in the first quarter and opened up a 12-6 advantage after the first quarter. When Austin Wilker, who appeared like he wanted to make his final home game memorable, scored the first four points in the second period and the first seven St. Marys points, the Roughriders broke out to a 19-9 advantage with four minutes left in the first half. The Riders would open its biggest lead of 11 points with a little more than three minutes remaining in the second quarter but Wapakoneta slowly began to find its shooting touch in the final two minutes and closed out the first half with a six-point run to slice the lead to 22-17 at halftime. Opening the second half, the Redskins maintained their momentum by forcing three turnovers in the first two minutes of the third quarter that ignited a 9-3 run and with 3:48 left in the quarter, Wapakoneta had cut the lead to one, 27-26. Wilker, who would score seven points in the third quarter, continued his excellent night of shooting to help the Riders maintain their lead and St. Marys held a one-point advantage, 34-33 going into the final eight minutes. But Wapakoneta’s defense continued to smother St. Marys and the Redskins grabbed their first lead of the game since the early first quarter, 35-34 at the 7:07 mark. Once Wapakoneta owned the lead they would never relinquish it. Wapakoneta’s Adam Scott, who had 13 second half points, finished the night with a team-high 16 points. Good, who also struggled in the first half with no points, pumped in 12 points. Gave Schenk contributed with 14 points. Wilker pumped in 22 points in his final home performance. This entry was tagged stmarys, Wapakoneta. Bookmark the permalink.